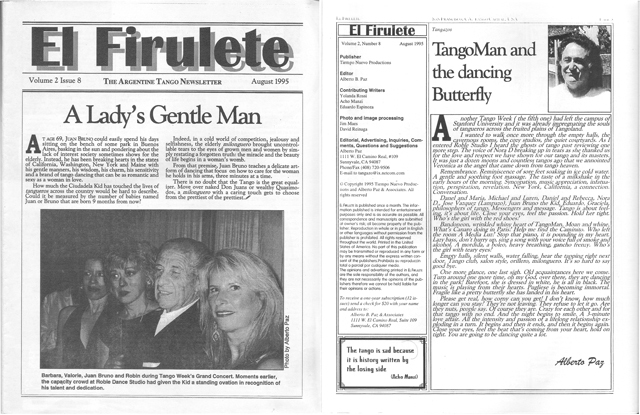 The Fifth edition of the legendary Stanford Tango Week in 1995 marked the beginning of the journey for many of us. We were treated to twin sets of tango weeks because of overwhelming registration. It was billed as the year of the milongueros, and American dancers were introduced to real life milongueros from the halls of Buenos Aires milongas. Our souls changed forever as we went our ways back across the United States. Two weeks after it ended, I went back to walk through the empty halls , the cavernous rooms, the cozy studios, the quiet courtyards. As I entered Roble Studio I could hear the ghostly sound of tango past reviewing one more step. The choking voice of a teacher thanking us for the love and respect we have shown for our tango and its masters. It had only been just a dozen moons and countless tangos ago that we had anointed Veronica as the angel who came down from tango heaven to paint a smile on Eduardo’s face. Remembrance. Reminiscence of sore feet soaking on ice cold water. A gentle and soothing foot massage. The cold sweetness of a milkshake in the early hours of the morning. Syncopation, music appreciation, infatuation, perspiration, revelation. New York, California. A connection. Conversation. Danel and Maria, Michael and Luren, Daniel and Rebecca, Nora, Lampazo, Juan Bruno, Eduardo and Veronica, Graciela. Dispensers of tango. Messengers and message. Tango is about feeling. Tango is about life. Close your eyes, feel the passion. Hold her close. Who’s the girl with the red shoes? The heart of Tangoman is a wrinkled bandoneon that moans and whines. What’s Canaro doing in Paris? Help me find the Caminito. Who left the room A media luz? Stop that piano that is pounding in my heart. Lazy bass, don’t hurry up. Sing a song with your voice full of smoke and alcohol. A mordida, a boleo, heavy breathing, gancho frenzy. Who’s the girl with teary eyes? Empty halls, silent walls, water falling. Hear the tapping right next door. Tango club, salon style, orillero, milonguero. It’s so hard to say good bye! One more glance, one last sigh. Old acquaintances here we come. Turn around one more time. Oh my God, over here, they are dancing in the park! Barefoot, she is dressed in white, he is all in black. The music is playing from their hearts. Pugliese is becoming immortal. Fragile like a pretty butterfly she has landed in his heart. Please get real!. How corny can you get! I don’t know… how much longer can you stay? They’re not leaving. They refuse to let it go. Are they nuts, people say. Of course they are. Crazy for each other and for that tango with no end. And the night begins to smile. A three-minute love affair. All the intensity and passion of a lifelong relationship exploding in a turn. It begins. Then it ends, and then begins again. Close your eyes, feel the beat that’s coming from your heart, hold on tight. You’re going to be dancing quite a lot. Beautiful Elegant Simply Stated Yet Overwhelming With Emotion Passion And Truly From The Heart ….